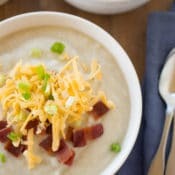 Ultimate light potato soup for the crock pot is an easy, healthy and delicious dinner choice that is sure to please your family. 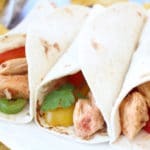 It’s easy on your budget and knocks off 370 calories per serving from the original recipe. 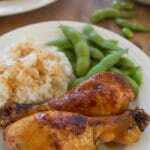 Try this healthy crock pot recipe today! Loaded baked potato soup is standard fare in my home state of Iowa and throughout the Midwest. I’m not sure where the recipe originated but I frequently see it popping up on menus when cold weather arrives. The creamy dreamy texture of classic potato soup comes from the starchy potatoes and full fat dairy products it contains. 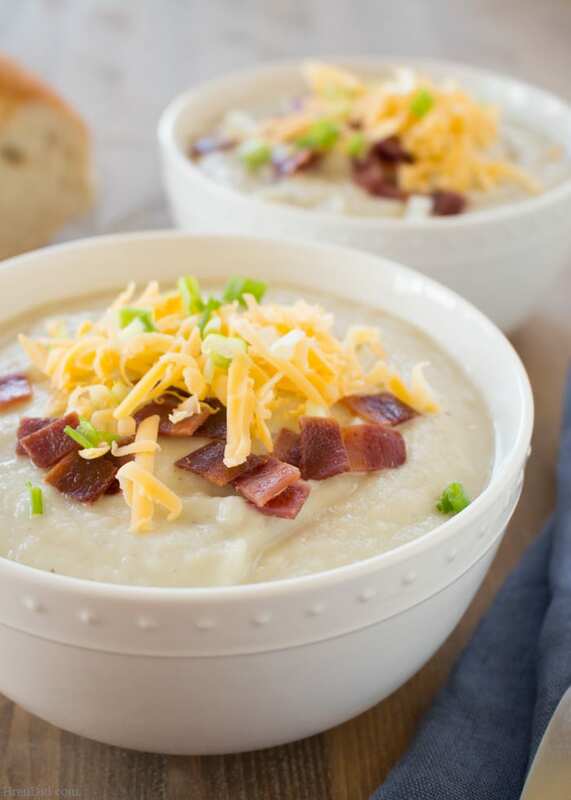 Potato soup was probably invented by an ingenious farm wife who had loads of potatoes in the root cellar, a cow that provided fresh cream each day, and a whole heap of hungry farm hands to feed. 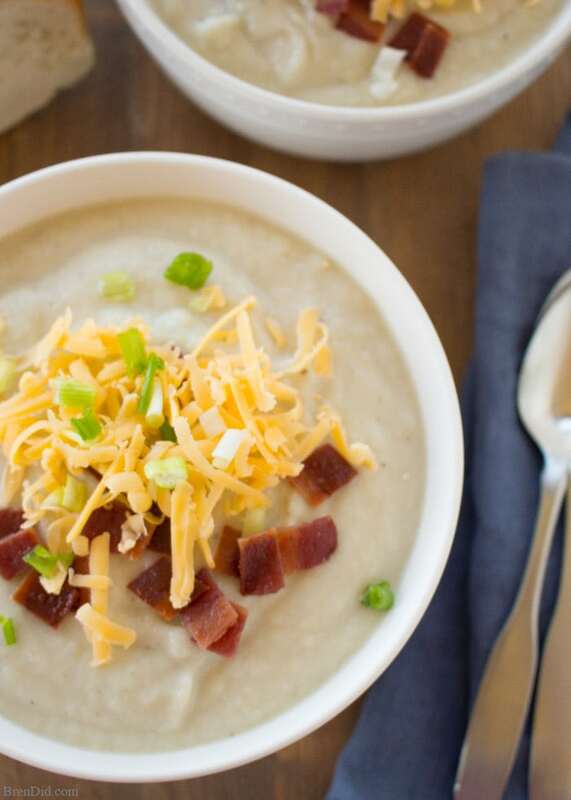 It’s definitely hearty and delicious: thick creamy potato soup loaded with salty bacon, scallion, and cheese. The only thing not to love about potato soup is the calorie and fat content. I rarely order potato soup because it is so calorie laden andnever made it at home. One classic potato soup recipe I found contains 585 calories and 38 gram of fat per serving (and that's before the cheese)! I'm afraid my suburban life doesn’t involve the hours of farm work necessary to burn off this treat. My kids were missing out! Enter the Ultimate Light Potato Soup! This healthy makeover of baked potato soup is sneakily packed with celery, cauliflower, and onions in addition to the standard potatoes. I promise that you won’t even know the vegetables are in the soup. They are slowly cooked in the crock post with the chicken broth and potatoes then blended smooth … it tastes and looks like pure potatoes! To make the soup even more healthy, I replaced the heavy cream commonly used in potato soup with skim milk that is thickened with flour. This simple roux is made by cooking a bit of butter with all-purpose flour and then slowly whisking in milk until a thick and creamy sauce is formed. This roux is stirred into the soup making it just as thick and creamy as full fat dairy. Classic potato soup contains nothing from the spice cabinet other than salt and pepper. This recipe calls for a bit of dried herbs to add flavor instead of relying on lots of added fat for depth. The result is so tasty that you don’t even need to load the soup with extra toppings. Don’t get me wrong, the toppings are an amazing addition, but the soup is delicious enough to serve on its own. Take this family favorite over the top by serving it with classic baked potato toppings such as easy oven-baked turkey bacon, shredded cheddar cheese, and sliced green onions. Set bowls of each next to the crock pot so each family member can customize their soup . Adding 8 ounces of shredded cheese, 8 ounces of turkey bacon, and 4 diced scallions to the recipe makes each serving approximately 396 calories. That's still a savings of 91 calories from the original…. and that recipe was not topped with cheese or scallions. Ultimate light potato soup for the crock pot is an easy, healthy and delicious dinner choice that is sure to please your family. 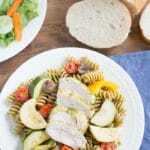 It’seasy on your budget and saves 370 calories per serving. 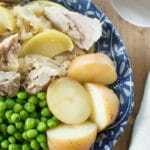 Try this healthy crock pot recipe today! 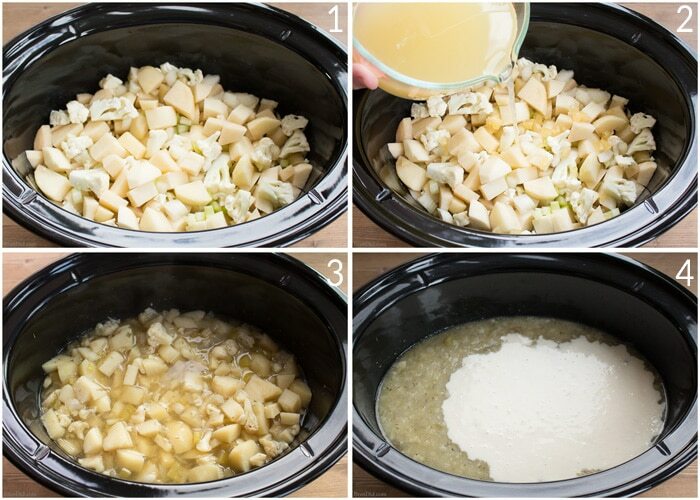 Place potatoes, cauliflower, celery, onion, garlic, and herbs in a slow cooker. Cover vegetables with chicken broth. Cook on HIGH for 4 hours or low for LOW for 7 hours* (potato should be tender). 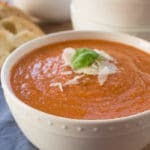 Use a potato masher or immersion blender to puree soup. Melt butter in a medium skillet and sprinkle with flour. Whisk continuously for 3-4 minutes until the mixture becomes golden yellow. Slowly add milk (about 1-2 tbsp at a time) whisking smooth between each addition. Once all the milk is added continue whisking and cooking until the mixture is thick (about 1 minute). Heat soup on low for 15-20 minutes or until hot. *Each slow cooker tends to cook at a slightly different speed. Watch new recipes closely the first time to find out exactly how long they take to cook to your liking. You should adjust all crock pot recipes for your slow or fast slow cooker. I hope you try this easy crock pot recipe. 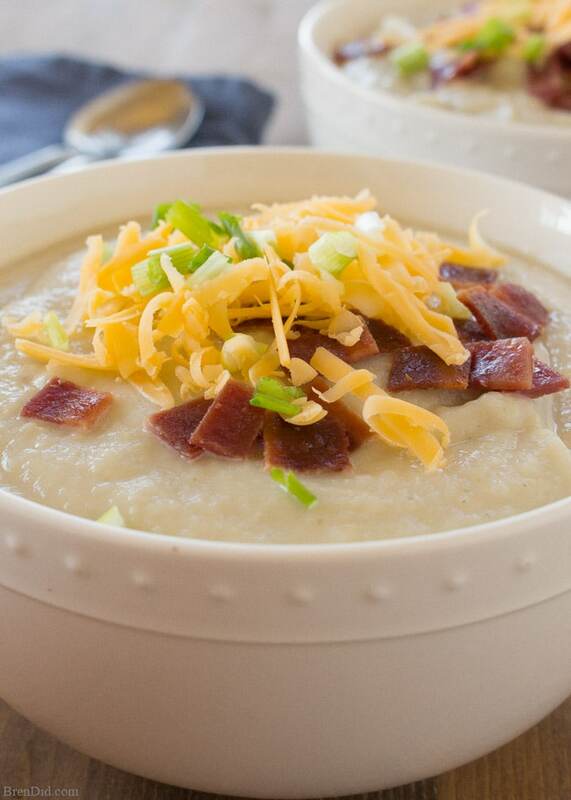 You're just four steps away from light potato soup that is sure to become a family favorite. Like my easy recipes? 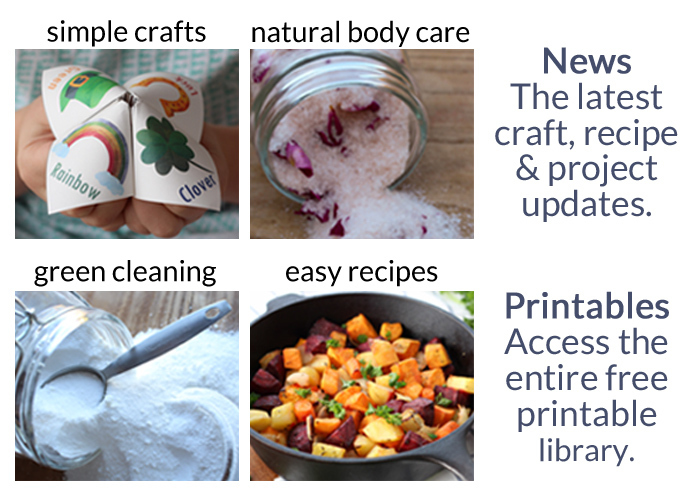 Sign up for my free newsletter below and never miss a thing! after made, can this be put in the freezer? Yes, freeze well covered for up to 3 months. Do you know how it would come out with almond milk? Thanks! I’ve never made it with almond milk, sorry! If you want to try I would use plain, not vanilla! My roux was clumpy and I followed your directions to a T. The soup was still great and I want to make it again, but any suggestions on what I could do differently next time? Holly, the key is to add the milk very slowly (1-2 Tbsps) to the flour butter and making sure to whisk the mixture until it is completely smooth before adding any more milk. It will be very thick and hard to whisk during the first few additions of milk. Keep whisking until it is smooth! The thinner the mixture gets the harder it is to remove the lumps. Hope this helps! Excellent recipe! Love to sneak in those veggies for the little ones. Made this in a pressure cooker in about 20 min. Thank you! Love the pressure cooker tip. Hi I loved this recipe! May I ask how much a serving is?! Each serving is approximately 1.5 cups. There are 8 servings in one batch. 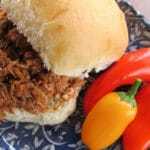 Found this recipe using a “healthy slow cooker” google search. Just made this for dinner today and it is yummy! Thank you for the recipe. We’re having this with spinach salad and crusty rolls for dinner. Can’t wait. I’m so glad you found the recipe, Robin. Your dinner sounds amazing! This is wonderful! I added some shredded chicken for extra protein and my family all gobble it right up! 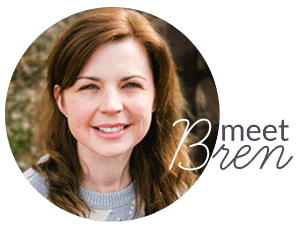 I’m so happy I found your site! Thank you! Thanks for rating the recipe, Jessica! I’m glad your family enjoyed it. I love the Pioneer Woman recipe for potato soup but it’s so unhealthy. I love that this tastes like that without all the fat! My waistline and I thank you!! You’re too sweet! Glad you enjoy the recipe!